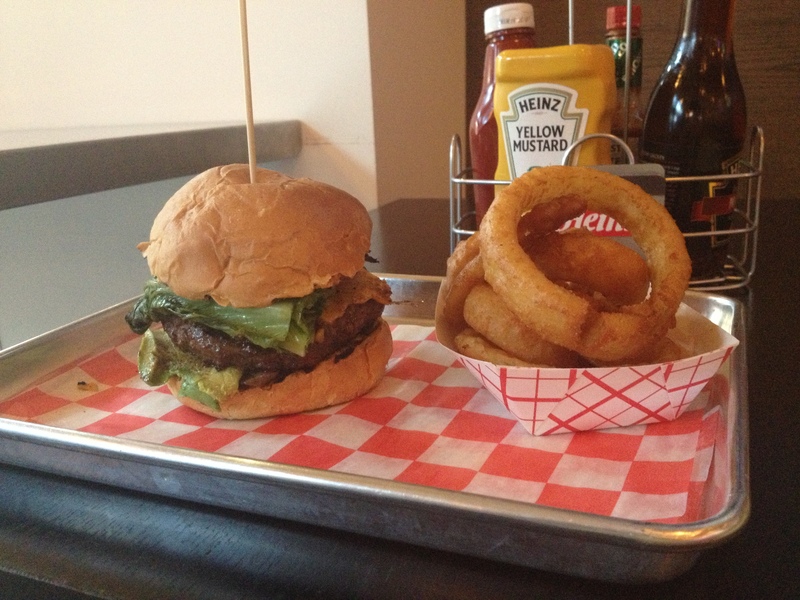 Our first trip to TD Burger in NoMa (250 K Street, NE) almost didn’t warrant a return trip. It was very disappointing as the restaurant has a great outdoor seating area and a Top Chef contestant as the chef (Timothy Dean). Yet, the fast casual burger restaurant had a weird set up, confused service, and unimpressive food. Since that, our most recent return trip saw some improvement. However, we hope that this trend continues and accelerates as the restaurant still needs help. Customers order their food at the counter and then go sit down with a number card for food to have their food delivered to them. But there’s a catch: you can’t order any alcoholic drinks at the counter and instead have to go to the bar or get the attention of the cocktail waiter/waitress (only one or two employees had the ability to serve alcohol even though there were close to ten employees serving customers). It took us around seven minutes to order drinks once we sat down even though the restaurant was empty and we’d already asked a different server for help. This was after waiting several minutes to order food (there was no one in line in front of us) due to a combination of the server being completely confused and the computer system being down. Additionally, this set up is not ideal as it requires customers to open a second tab for alcohol even if they only want to order a beer. The food did not improve the night. The “Sonia from the Bronx” burger sounded intriguing: avocado, cheddar cheese, mushrooms, and grilled romaine. The burger probably would have been great if it had been served as a salad without the bun. The grilled romaine was tasty and the burger had promising flavor. Unfortunately, all of this was overshadowed by a soggy bun that fell apart and could not hold the burger properly. We were a little confused at how the bun was so soggy as it had clearly been thrown on the grill for a few seconds and had light grill marks. Regardless, it ruined the burger. The allegedly “beer battered” onion rings tasted like onion rings we could have picked up in the frozen section of the grocery store.